At the beginning of 2007, The United States Marine Corps opened a recruitment office in downtown Berkeley, California. 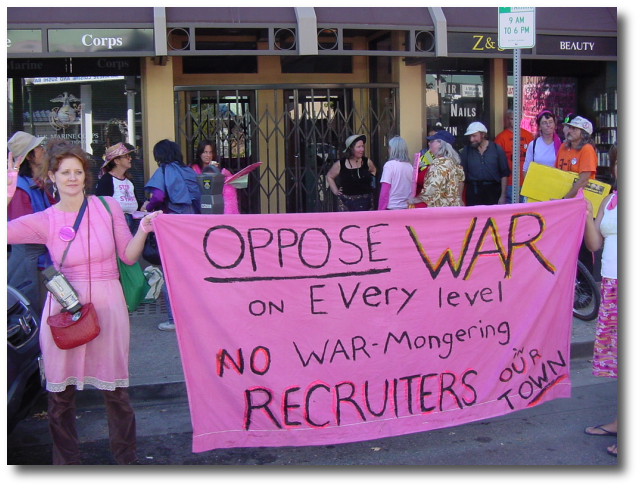 At first the office went unnoticed by Bay Area anti-war groups, but starting in September the local chapter of Code Pink discovered the existence of the recruitment office and decided to initiate a series of "direct actions" against the Marines, with the intent of driving them from the city. The weekly protests didn't much register in the media until Code Pink (and yes, I know that officially it's spelled "CODEPINK," but in this report I'll use the more commonly seen spelling) defaced the office window, altering the words "U.S. Marine Corps Officer Selection Office" to "U.S. Marine Corps Officer Assasination [sic] Office." Publicity over this incident inspired conservative talk-show host Melanie Morgan to call for a counter-protest to coincide with Code Pink's weekly scheduled protest at noon on Wednesday, October 17. Since I will be unable to attend that rally, the report you see on this page is not about the October 17 event (which has not yet happened at the time of this writing), but rather of a surprise protest by Code Pink at the Marine Corps office on Sunday, October 7, in the aftermath of their appearance at that day's Beach Impeach IV rally elsewhere in Berkeley. 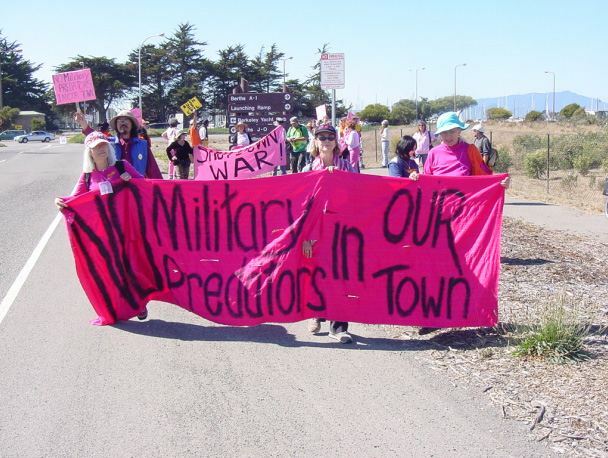 I attended the Beach Impeach IV rally with Code Pink, but did not accompany them on their subsequent 3-mile march from the Berkeley Marina up to Shattuck Avenue (the site of Marine Corps office). 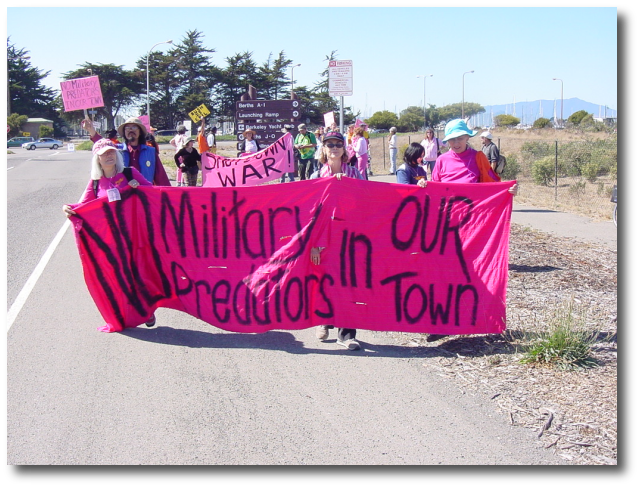 Photographer Robert Livingston did accompany them, however, and snapped this shot of Code Pink marching along with their banner calling for "No Military Predators in Our Town." Meanwhile, back up at the office, other Code Pink members had already strategically stationed their official truck in an adjacent parking spot. The back of the truck advertised yet another protest a few days afterward. The first "scouts" from the Code Pink march arrived at the nearby intersection of Shattuck and University, and quickly sketched out a new banner for the occasion. Simultaneously, the "San Francisco Values" bus (which had been ferrying Code Pink protesters to the Beach Impeach rally earlier in the day) circled the block, looking for a conspicuous place to park in support of the day's event. It was covered in slogans. Unable to find a spot on the crowded streets of downtown Berkeley, the bus driver eventually just double-parked in front of the office. Just then, the first Code Pink protesters finally arrived at their destination. They rapidly took up positions. They spread out along the sidewalk, under the watchful eyes of the police, who made sure there was no hanky-panky, or damage to the office window. Robert Livingston was also on hand and captured this shot of the inaugural unveiling of the banner we saw being made earlier, its paint still wet. And, well, that was about it for the protest. We stood around for a while, trying to catch the attention of passing cars. Since there were no counter-protesters, and not many passersby, there wasn't much to do. After a while, the protest dissipated and everyone went home. While the police had made sure that no damage was done to the office itself, Code Pink had ascertained that writing with chalk on the sidewalk is legal at protests, and the police can't stop them. So they left a variety of messages to greet the Marine recruiter when he arrived at the office the next morning. I returned after everyone had left to get some clear shots of the sidewalk messages. This one summed up the best-known 21st-century anti-war canards. A variant on the "baby-killers" meme. As a counterpoint, the Marine in charge of the office had placed this quote from John Stuart Mill in the window. The silent battle of words continued back and forth across the sidewalk. 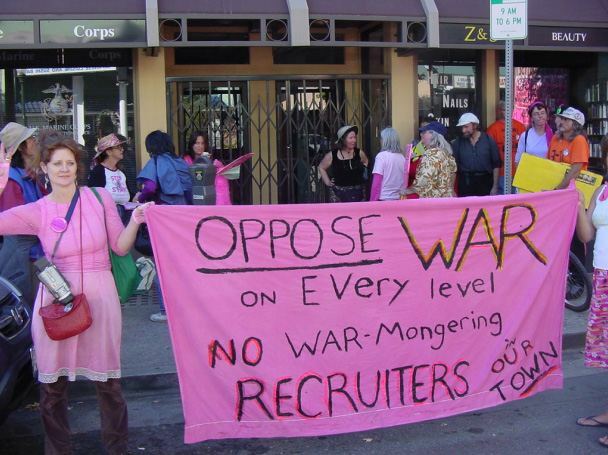 Code Pink warned any potential recruits to "Stay away." In response to the earlier protests, Captain Richard Lund (the Marine in charge of the office) wrote this "Open Letter to Code Pink," which was printed in the Berkeley Daily Planet and which has already become well-known, being widely linked on conservative Web sites. Lund posted the letter in the office window as his answer to his critics. Will there be future conflicts at the Berkeley Marine Corps recruitment office? Signs point to "Yes."